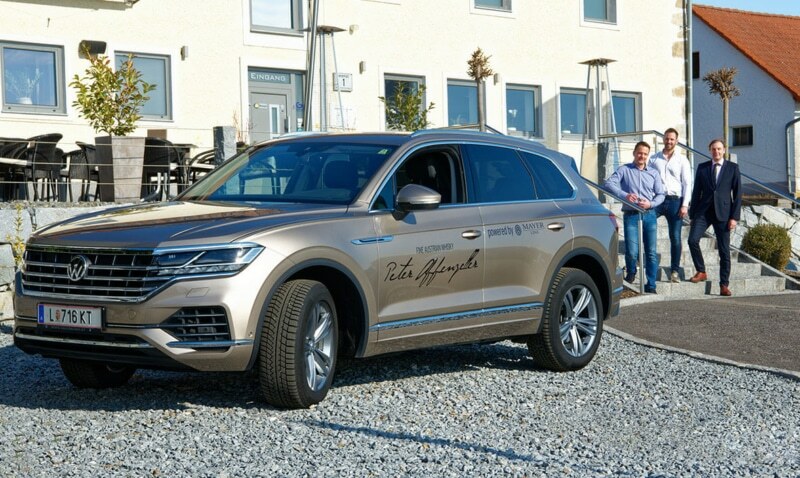 The Whisky Distillery has concluded a regional cooperation with Mayer car dealership, through which a 2018 gold Volkswagen Touareg is provided. A special type of whisky shuttle will be implemented. With its many comfortable features and dynamic driving, the journey from the whole of Upper Austria to the whisky tasting tour is an experience. When the Volkswagen Touareg is not driving around Upper Austria, it is parked in front of the Whisky Distillery driveway. Like both companies, the car symbolizes strength and dynamism. The SUV is recognisable through it’s powerful front with elongated bonnet, sharply contoured side lines, and striking LED tail light clusters. Two strong companies join together and embody an innovative cooperation, that is emphasized in the custom made logo and inscription “Whisky Shuttle”. The Volkswagen Touareg fuses SUV with elegance and driving experience. Please feel free to come by and take a closer look at the car or visit Mayer car dealership in Industriezeile 72, 4020.